Wow, talk about plot twists that turn on a dime! 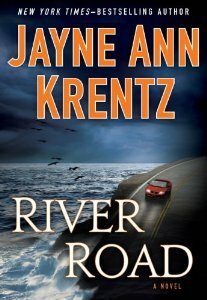 This latest romantic suspense from Ms. Krentz is a real page flipper. It has a body count, surprise villains, suspicious activities and through it all, an attraction rekindles and passion explodes into love. It’s the progression of the plot, the dance of the romance and the dynamics between Mason and Lucy that sealed the deal for me. This is a must read. I liked how Ms. Krentz set the stage for what would eventually take place later in the book. I enjoyed the sleuthing, the methods used and the wrong turns the hero and heroine took in the book. The dialogue was key in getting to know the main protagonists and internal dialogue provided clues as to one of the possible antagonists. I truly was surprised at the revelation and even then, the author had a surprise for me and Lucy. I never saw it coming. When Lucy did figure it out, it was a rather unique way of doing it, which impressed me. I wonder where the author found out about that profession and what inspired her to use it in this book? However it came about, it worked; it was gripping and effective. Another aspect that is sure to please readers is the spark. When Mason and Lucy finally reach the combustion point it was very steamy. The sexiest scene in the whole book stems from an impromptu Kegel. I’m not sure why that part had me so flustered but it was powerful and very, very hot. Mason made me melt. Dialogue between Deke and Mason, Lucy and others really contributed to the feel of the story. They talked and chatted like anyone else would, although not too many would be chatting and making jokes of a dead body. You have to read it to understand why that was effective. I liked how the suspense and drama kept getting tighter and tighter to the point when I knew something had to give. I enjoyed seeing how Mason and Lucy navigated the pitfalls by drawing upon the life experiences that they had as they became the people they were in the story. That showing of growth was very appealing. The happily ever after made me laugh. As romantic as it eventually became, the dialogue and interaction between Mason and Lucy is chuckle-worthy up until the end when I sighed with satisfaction. I love a good romantic ending. River Road is great. With a tale written as well as this one, it’s a fast easy read because every chapter provided more clues, more questions and more of everything that makes a book gripping – so much so I had a hard time putting it down. I highly recommend this latest adventure from the clever mind of Ms. Krentz. It’s a winner.